Ebrahim Ehrari‘s great topics in his masterful and well-known etchings especially Aqua Tinta still occupy him in his colourful oil paintings. His life experiences are flowing into his surreal, metaphorical pictorial worlds: abstract sea landscapes as habitat and primordial force, animals as symbols for persecution & escape, permanent threat and apparent rescue in desired harmony. The balance between European and oriental pictorial traditions, between imagery and poetically symbolic, create levels full of allusion. Günay Shamsi, from a well-known Azerbaijani artist family, has acquired and perfected in her art studies in Azerbaijan a wide range of technical skills and expanded her knowledge and skills with her studies of sculpture here in Berlin. On this basis of great skill she can now experiment freely and without any inhibitions. Meanwhile she has created her very own style "Pop Surrealism" and surprises always with artwork of striking themes and freshness. Credo: there are no limits, everything should be allowed. Wava Roestamova paints with acrylic and watercolors as well as with pastel chalks on linen, cardboard and paper, she likes to experiment with new materials. In fine-tailed, closely interwoven pictorial compositions the artist recalls the culture and history of her homeland in Azerbaijan. Her paintings and drawings often consist of several layers and she likes to use symbols as building blocks. She introduces both paradise and war. It is all about feelings, shapes, lines and colours, and she likes to describe herself as analytical, lyrical and romantic. Anar Shamsiyev shows in in his series "Those who lost their heads", people who had this destiny or path. In the era of information over-flow and high-tech, people spend a lot of time on the web and realize their dreams via www. In this aberration he would like to show the fate of these headless human beings and to shed light on all aspects that can cause these phenomena and possibly cause the collapse of society. The artist sees his series as a project about spiritual dilapidation and chaos. Antonia Duende wants to enter into the secrets of the unfathomable. She strives by expressing in symbols, the revelation of the connection between mankind and cosmos. Since 2005, she has been studying historical monuments with texts of various characters on the basis of frottages. Through subsequent multi-layer processing of the painting surface with watercolor and integration of other coding systems, she initiates a dialogue of symbolic characters and characters of different cultures with their own pictorial vocabulary. Nikolai Ivanov is a multi-layered artist: painter, well-known composer, fresco & facade designer, mosaic & glass artist... He mixes modernity with tradition, different genres and pictorial languages, installations and performances; all this is united in the idea of complete synthesis, which for Nikolai is the epitome of Modern Art. 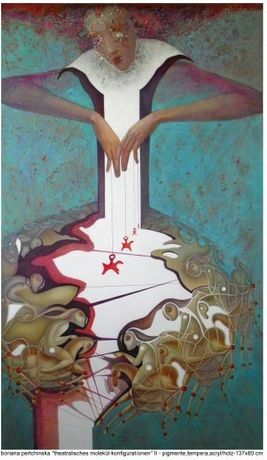 His paintings are abstract and sacred with complex mixed techniques, inspired by the orthodox iconic tradition and the eastern tanka poems, frescoes and mandalas. His pictures sound and his music is pictorial. Dimitar Hinkov‘s series “Landscape as a Fairy Tale” shows the artist’s idealized conception of forest – the quiet power of nature, the charm & the uniqueness of the trees and the beauty. The paintings recreates the full fresh greens of the grass, the massiveness of the trees, as well the gentleness of the leaves and the feeling of nature fairy tale. The collection “Stolen Beauty” is the artist’s provocation to the Time. It is a competition, a confrontation with the momentum. Hinkov’s idea is to steal the transient beauty and preserve it to last. Boriana Pertchinska interprets in her Tryptic "Theatrical Molecule", eternal themes "where do we come from? ", "Who are we? ", "Where do we go?*. With the visual construction of the molecule she develops the metaphor for the "great puppeteer", as she calls it, who moves complete systems. Egg-grounds, pigments, tempera - in countless layers and glazes give the artistic material profundity. In her installation "Emotions in Flasks", she deals with the tendency of our society to archive, sort, order and label - a society built in boxes.